Storyline: When Eyal finishes the week of mourning for his late son, his wife urges him to return to their routine but instead he gets high with a young neighbor and sets out to discover that there are still things in his life worth living for. 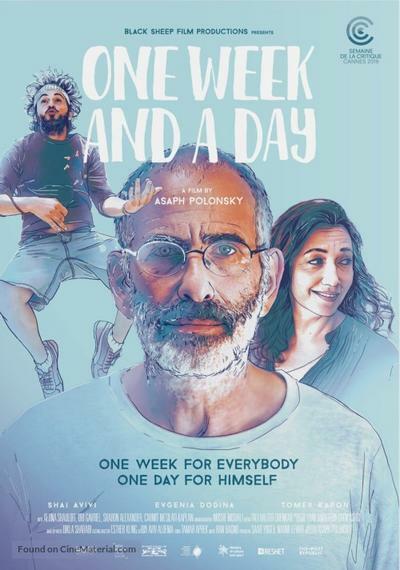 Review from IMDB: “A week and a Day” is Asaph Polonsky’s first feature film and tries to combine drama with humour, levity and death. It does so successfully and warmed the crowd in Montreal where it received deserved praise. It deals with a tough subject, arguably the greatest loss, done slightly better and with more bitterness in 2001 with “In the Bedroom” and “Lantana”. “Rabbit Hole” (2010) was also riveting, but “A week and a Day” (2016) is superior to more recent, yet good and critically acclaimed “The Broken Circle Breakdown” (2012) and very different than all the others and succeeds in a change of perspective and cinematic catharsis.